President Trump has tried using economic leverage over China as a way to coerce them into helping the U.S. with North Korea. It hasn't worked well so far, but Trump's optimism on securing China's help seemed to come back today when he tweeted about his "excellent meeting on trade & North Korea" with China's President Xi Jinping. But Trump's tone on China changes month to month, and there's been a clear difference in his views on Twitter compared to what he says to President Xi in person. Why it matters: Axios' Jonathan Swan points out Trump tried his charm on Xi — lavishing him in hospitality at Mar-a-Lago — but has already discovered that Xi cannot, or is unwilling to, do what's required to stop North Korea's rush to develop nukes — so now he's getting tough on trade with Xi. But his ever-changing tone could discourage Xi from cooperating. "We are developing, and have developed, a wonderful relationship. I appreciate the things that you have done relevant to the very substantial problem that we all face in North Korea — a problem that something has to be done about. And I'm sure whether it's on trade or whether it's on North Korea ... we will come to a successful conclusion. ... And I know that China in particular, which is a very great trading partner, we will be able to do something that is equitable and reciprocal." Just this week he tweet-shamed China about their trade with North Korea: "Trade between China and North Korea grew almost 40% in the first quarter. So much for China working with us - but we had to give it a try!" In June, Trump's view on China wasn't great: "While I greatly appreciate the efforts of President Xi & China to help with North Korea, it has not worked out. At least I know China tried!" 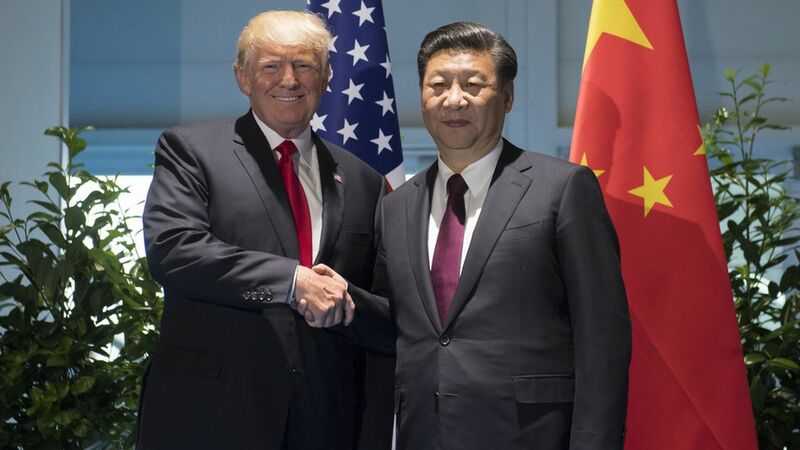 In April, Trump said things were "tremendous": "It was a great honor to have President Xi Jinping and Madame Peng Liyuan of China as our guests in the United States. Tremendous..."
But later that same month, he changed his tone, a few times: "North Korea is looking for trouble. If China decides to help, that would be great. If not, we will solve the problem without them! U.S.A."
"Had a very good call last night with the President of China concerning the menace of North Korea." "Why would I call China a currency manipulator when they are working with us on the North Korean problem? We will see what happens!" "I have great confidence that China will properly deal with North Korea. If they are unable to do so, the U.S., with its allies, will! U.S.A."
And he used economic leverage against them: "I explained to the President of China that a trade deal with the U.S. will be far better for them if they solve the North Korean problem!" "North Korea is behaving very badly. They have been "playing" the United States for years. China has done little to help!" In January, Trump tweeted: "China has been taking out massive amounts of money & wealth from the U.S. in totally one-sided trade, but won't help with North Korea. Nice!" Programming note: In the official White House readout of their meeting, it referred to Xi as the leader of the "Republic of China," which is actually Taiwan. Xi is the leader of the People's Republic of China.